Need some assistance in staying USP 797 compliant? 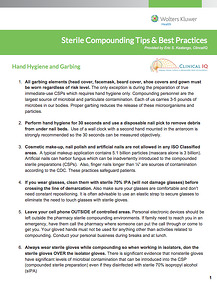 With the help of industry expert Eric S. Kastango, MBA, RPh, FASHP we've documented 46 tips that will ensure your sterile compounding practices are safe and USP 797 compliant. To access the tip sheet, please fill out the form to the right.